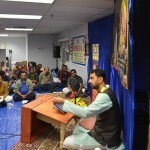 Devotees in Boston were blessed to witness Srimad Bhagavata Saptaham for 7 days from 22nd to 28th October 2015 by Sri Ramanujamji. 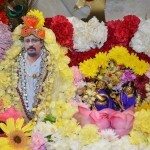 Over the seven days, there was an incessant shower of nectar – Bhagavatamruta – specifically Krishna Leelamruta. 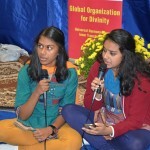 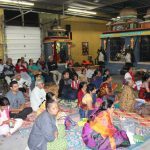 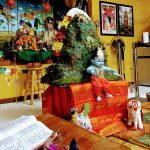 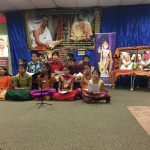 The Saptaham commenced on October 22nd evening at the Acton Hindu Temple with the welcoming of the Bhagavata Bhagavan and the Divine Couple into the temple. 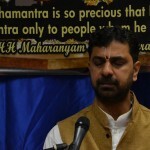 Sri Ramanujamji discoursed on Bhagavata Mahatymyam. 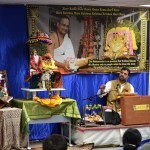 On Friday Oct 23rd, Sri Ramanujamji took us to the 10th Canto of Bhagavatam and expounded on the Divine Krishna Leela, commencing with Krishna Jananam. 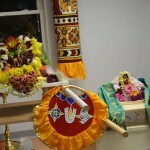 The Lordships were decorated on a beautiful elephant ‘Vahana’, and amidst the singing of Kirtans, the young ones and the ladies celebrated the birth of Krishna with Kolattam and dance whereas the gentlemen did a procession of the Divine Couple on Yanai Vahanam to the music of Sri Narayana Theertha’s Tarangam. 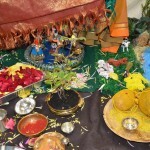 This was followed by Bala Leelas, Damodhara Leela, Govardhan Leela, Rasa Leela and Rukmini Kalyanam on subsequent days. 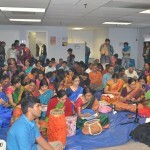 Ras Leela and Ras Poornima were celebrated with Dandiya dance. 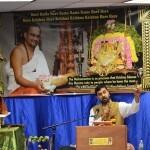 On the last day, Sri Ramanujamji bathed all the audience with the amrutha of Kuchelopakhyana and Nava Yogi Upakhyana concluding the seven day Saptaha Katha. 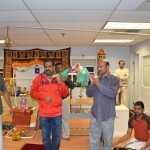 All the attending families were blessed with prasadams from our Guru Maharaj.. 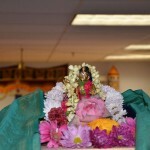 In the mornings, the day started with Prabodhanam and Bhagavata Parayana. 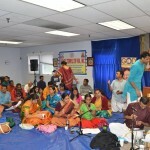 The parayana of the 10th canto of Bhagavatam – Poorvardha – culminating with Rukmini Kalyanam was done. 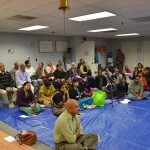 Many devotees participated with interest in the Parayanam sessions. 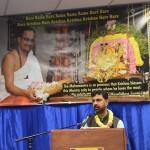 Over the weekend of October 24th – 25th, a grand Radha Kalyanam event was performed. 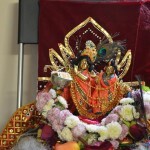 On the evening of Saturday Oct 24th, the Divine Couple were decked up for Janavasam. 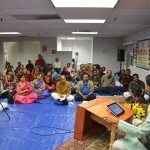 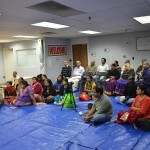 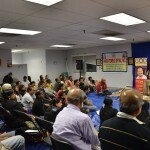 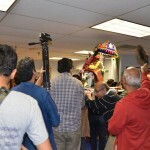 Bhagavatas from various towns like Houston, Dallas, Virginia had arrived and Ashtapadi Bhajans commenced by 3:30 pm. 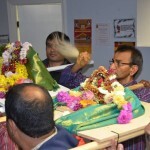 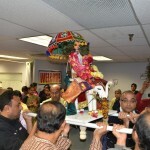 After the evening discourse, the Janavasam of the Divine Couple was celebrated with exchange of garlands. 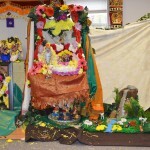 On Sunday Oct 25th morning, the venue was transported to Brindavanam where the community had joined hands to decorate the entire stage as Sri Brindavanam. 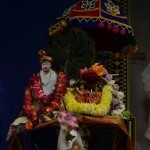 The ‘jhoola’ was tastefully decorated with flowers and garlands and the divine couple were royally seated along with Guru Maharaj. 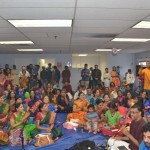 Devotees slowly poured in and joined in the rendering of Ashtapadis and singing of the Kirtans. 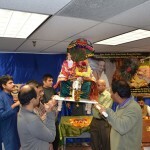 As the Kalyana Ashtapadi was sung by local youth talent, the ‘seer’ bhakshanams were brought. 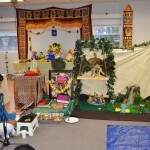 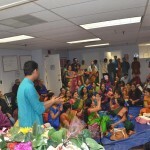 Tulsi Pooja was also performed. 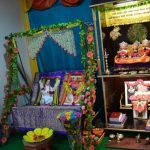 Amidst chanting of Pravaram and Lagnashtakam, the Divine Couple were united in wedlock as the 200+ devotees rejoiced in divine bliss. 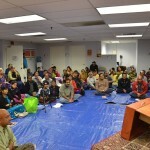 As the discourse started on the concluding day, it seemed as if the divine had accepted the saptaham as indicated by the heavy downpour. 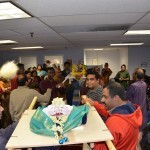 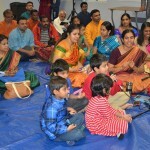 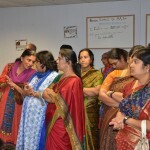 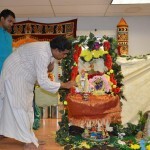 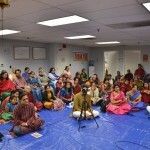 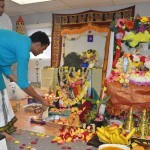 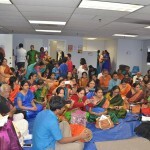 The seven days of festivities were enjoyed by more than 200+ devotees from in and around Boston. 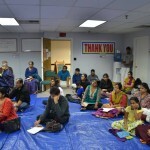 Devotees from California, Houston, Dallas, New Hampshire and Virginia attended and helped in all the kaimkaryas throughout the seven days. 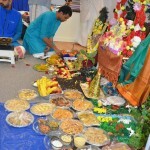 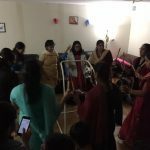 The entire community of Acton and neighboring areas took upon themselves kainkaryas like stringing garlands, food preparation and distribution, preparation of sweets and savories for the Radha Kalyanam and many other responsibilities.